I'm not quite ready to admit that fall is here -- even if I am wearing tights and boots. 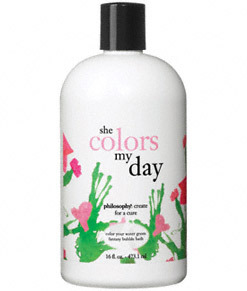 So Philosophy She Colors My Day is the perfect thing to keep me feeling springy. The kelly green liquid within the floral-emblazoned bottle is so bright and cheerful, it just puts a smile on my face every time I pour it into the tub. Now, I must warn you. This stuff really is green. So use a bit sparingly, as it might start to stain the tub if too much is used at once! Luckily, it foams and bubbles so delightfully, you can sink into the mass and completely envelop yourself in lovely goodness. This bottle was created by Philosophy founder Cristina Carlino to celebrate the bond between mothers and daughters. The song lyrics found on the bottle were written by Carlino after she was inspired by artwork drawn by her daughter. And the best part? 100 percent of proceeds will be donated to the Entertainment Industry Foundation's Women Cancer Research Fund. Your day will be quite colorful, I assure you.